No, not by train. The journey is by foot, and it is a travel through history. GST brings us back to the days when train travel was something special, and a gracious and grand station was required. This landmark building dating back to 1913 certainly is that, and more. Yet, there was a time when this icon of New York was in danger of obscurity and demolition. It was in the 1970s. New York City's recently created Landmarks Preservation Commission (formed in response to the demolition of the original Pennsylvania Station) had designation Grand Central Terminal as a landmark, providing it with a measure of protection. But Penn Central owned it and had other, far more lucrative plans. The battle for control raged for 10 years, eventually culminating in a Supreme Court decision on June 16, 1978 upholding New York's landmark law. The building was saved, but rejoicing was premature. Years of neglect had left a leaky roof, chipped away stone work, and rusted steel support column. Years worth of grime covered the surfaces. To help firmly fasten it to public awareness and help insure its survival, the Municipal Art Society began offering free walking tours. In 1983 Metro-North, the suburban commuter railroad, took over the terminal and began a multi-year, multi-million reclamation project. Today Grand Central Terminal has become a working tourist attraction a train station for commuters, and a visitor destination. There are several ways to experience Grand Central Terminal provides a do-it-yourself guide available online, the Grand Central Partnership offers free tours on Friday afternoons, and the Municipal Art Society provides its tour on Wednesday afternoons at 12:30 PM. On the day I attended the 90-minute MAS tour was led by Francis Morrone, an architectural historian and author. New Yorkers and out-of-towners alike, we followed him like obedient school children as he held his hand aloft and waved. We dodged and weaved through the commuting throng. 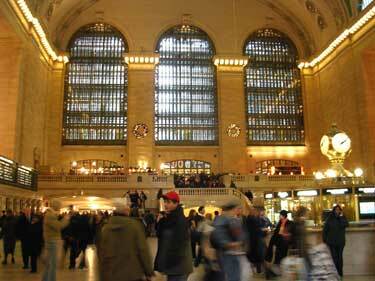 Our Grand Central Terminal was built between 1903 and 1913, opening February 2, 1913. However, the building we were about to explore was actually the second GST. The first was built by the New York Central Railroad, owned by Cornelius Vanderbilt, and opened in 1871. It was demolished after the turn of the century, victim to both the popularity of train travel, and technology. Built in the era of steam engines, train depots and yards had be outdoors to allow the belching smoke to dissipate. When electricity enabled the development of smoke-free engines, everything could disappear underground, freeing up a huge tract of prime New York real estate. The outside of the current terminal is made of Indiana limestone. Inside the walls are faced not with French limestone as generally reported, but, according to our guide, cast stone faux stone a thin coating of gypsum plaster molded to simulate the stone from Normandy. Liberal use of cast stone and the Italian marble facing on the lower part of many of the walls gives the impression that GST is a massive fortress of stone. In fact, its heart is made of steel, with the cast stone, marble, and ironwork as the skin that gives it nuance and beauty. The floors are still the original Tennessee pink marble complete the chips and cracks of almost 100 years of wear. "It's an amazing testament to the stone's durability," notes Morrone. Travertine marble, and ornamental ironwork in the window frames and chandeliers complete the ambiance of old grand days. Today, only a tiny portion of the great station is above ground. 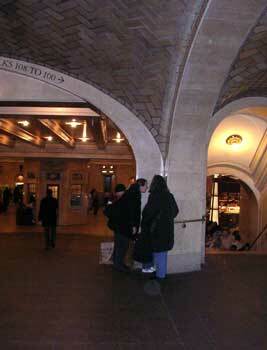 Even the enormous lobby is submerged 16 feet under the concrete of the city. Below ground the station extends west to Madison Avenue, east to Lexington, and North to 50th street -- all on land originally open during the era of the first GST. Putting the tracks and yard underground precipitated a mini boom as 30 new buildings rose up. Most were torn down in the 1950s and 1960s but a tiny, somewhat forlorn, corner of one of the original buildings, the Biltmore Hotel, still stands intact. It can be reached from 42nd Street, although it's now the Bank of America plaza, with a totally new facade and interior. The interesting part is actually right downstairs, in what was once the arrival station. 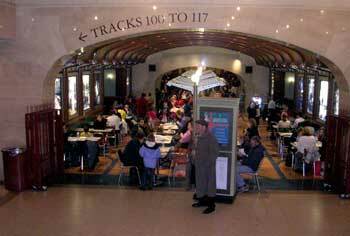 Behind a glass window is one of the original Arrivals chalk boards listing the incoming trains. A schedule has been recreated with some of the famous and not-so-famous. The Berkshire Express will be coming in on track 141 at 11:35. Get ready to meet your party. Downstairs is also the Dining Concourse, part of the departure station, brightly lit but with marble and touches of bygone elegance. There's an almost endless series of tiny food stations covering almost every type of cuisine imaginable. Greek, Chinese, dairy and deli, Japanese most with inventive and inviting names. Eata Pita, Feng Shui. Above each entrance to the departure tracks are ornate headpieces composed of oak leaves and vines, with a large V for Vanderbilt. It reflects the Vanderbilt determination to create a family aura and a history, and the family motto roughly great oaks from little acorns grow. Illustrated by the theme of acorns and oak leaves. The Oyster Bar Restaurant is one of the grand dame restaurants in NYC, dating back to 1913 opening the same day as the terminal. But the tourists (including New Yorkers doing the tourist thing) flock to the open space in front -- the so-called Whispering Gallery. Although not designed with that activity in mind, the acoustics of the space have actually created a parabola that is said to catch and transport whispers from one corner of the gallery to the corner diagonally opposite. A fellow skeptic and I tried this out, and it does work, sort of. It's a bit faint, having to contend with all the ambient noise, and to be successful you do have to put your nose just about touching the stone and speak up. But who could resist? And the kids will love it. One of the recovered glories is the ceiling of the main terminal. Originally a painted fresco of the star constellations against a bright cerulean blue sky, inadequate ventilation and the ravages of time caused fading. It was replaced in the 1940s with painted canvas panels. But this time, the ceiling slowly darkened the result of the grime of accumulated tar and nicotine from countless commuter cigarettes, cigars, and pipes. Almost every inch has been gently scrubbed clean, except for a tiny patch at the northwest corner. It looks like a tiny piece of black tape stuck to the corner. Instead it's a patch of original grime so visitors can appreciate the immense effort to restore and recreate the beauty and elegance of a long-gone time, and the truly Grand Central Terminal. It's not only a tour of one of New York's icons, it's a trip back to see why there's a Grand in Grand Central Terminal.